Odessa apartments. Rent apartment in Odessa. Apartments in Odessa, Ukraine for rent. If you're just not ready to pay high nightly rates for some of the better city hotels during the peak summer season, we have a great alternative for you -- apartments for rent in Odessa, Ukraine! We handpicked 11 secure, clean, comfortable, and completely furnished apartments for your next stay in one of the Ukraine’s famous resort cities – Odessa. All Odessa apartments are of a high quality. 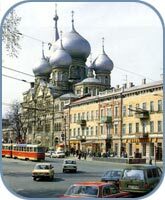 All of them are up to European standards, all are located in the heart of the Odessa city. Almost all of these apartments have air conditioners and phones. All cooking facilities: gas stoves with ovens, electric kettles, and refrigerators are available. Kitchen is fully stocked with utensils, pans, frying pans, plates, cups, mugs, glasses, knives, spoons, etc. Some of the higher priced apartments have microwaves, Satellite TV, and TV sets. Apartments are cleaned and linens are changed twice a week. Emergency assistance is available 24/7. Additional services can be provided in conjunction with Full-Service Apartment rentals in Odessa.